Location of XO Hotels Park West – How can you reach us? You can reach the location of the XO Hotels Park West from Schiphol airport by different means of transportation. By taxi: the costs are approximately €40,00 and it takes roughly 15 to 20 minutes. Please take a taxi from the designated area. With the Connexxion Airport Hotel Shuttle: the costs are € 17,50 for a single ticket and €28,00 for a return ticket. Tickets are available from their office at arrival hall 4. By public transport: You can go by train to Amsterdam Sloterdijk. The costs are € 3,70 for a single ticket and takes roughly 10 minutes. From Amsterdam Sloterdijk Station you can walk to our hotel for approx. 8 minutes (follow the tram track), or you can take tram nr. 19 for only 1 stop to the tram stop called Molenwerf. This stop is in front of the hotel entrance. A single ticket for the tram of the company GVB costs € 3. It could be interesting to buy a combination ticket for both train and tram on the page of Discover Holland. XO Hotels Park West is situated next to the highway A10, exit S103. 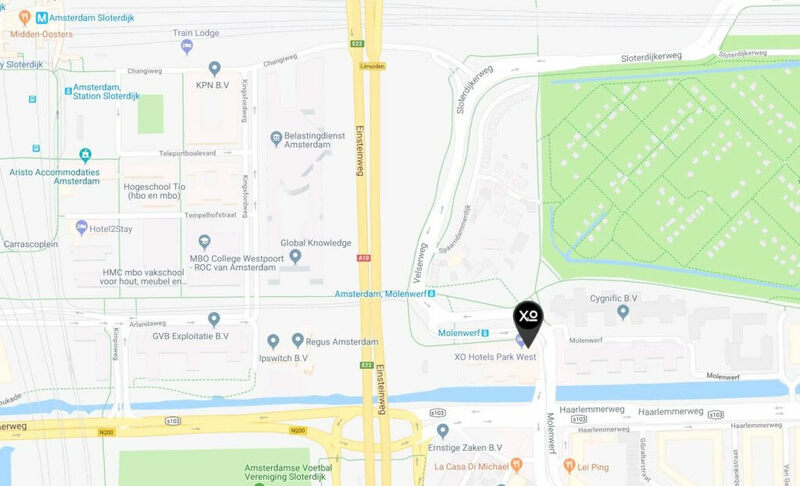 If you are using navigation to find our location, please use the address Molenwerf 2 to make sure you end up at the right side of the Molenwerf street. Visit Google maps to plan your route to the hotel. The entrance to our parking garage is next to the hotel, at the end of the building and to park your car we ask € 2 per hour, with a maximum of € 15 a day. Parking is subject to availability, it is not possible to reserve a parking space. Due to roadworks between 17 May and mid September, XO Hotels Park West can be reached via a different route. You can follow the signs with ‘XO Hotels Park West’. Do you prefer to drive with navigation? The route on Google Maps will be adjusted to the temporary situation. The roadworks take place on working days and occasionally during weekends from 7:00 – 16:00 and may cause nuisance. You can reach the city centre from the hotel by tram. The tram stop is located in front of the hotel. The hotel sells day and multiple day cards for the public transportation from the company GVB and can be purchased in our vending machine, located in the reception area. To Dam Square: you can take tram 19 (direction Diemen) from the stop in front of the hotel and then change to tram 13 or 17 (both direction Central Station) at the stop Marnixstraat. To Museum Square/Rijksmuseum: you can take tram 19 (direction Diemen) to the stop Spiegelstraat. From the hotel you can either walk (approximately 8 minutes, follow the tram track) or take tram 19 to Amsterdam Sloterdijk. From Amsterdam Sloterdijk you can take metro 50 (direction Gein) until Station Rai. From the metrostation it is approximately a 7 minute walk to the RAI.